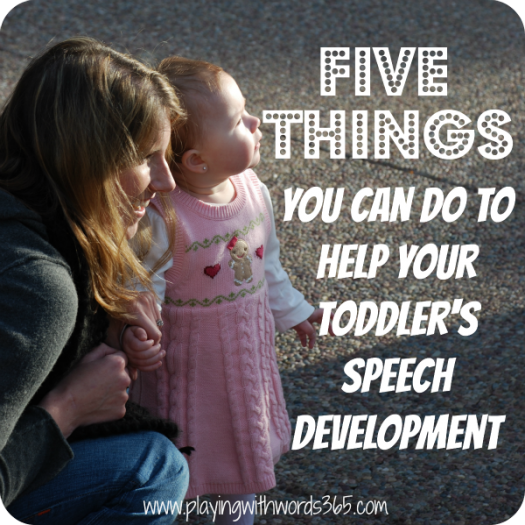 Want My 5 Tips to Help Your Toddler’s Speech and Language Development? Then you need to head over to Toddler Approved right now and check out my guest post today! Today I am sharing 5 tips to help your toddler learn language and communicate. Some of them may seem obvious but ask yourself this: Are you doing them everyday? I want to hear! Head on over to Toddler Approved (an awesome blog you should be following anyway) right now and let me know what you think. Leave a comment and be sure to follow Toddler Approved on Facebook for great learning activities for toddlers to preschoolers! if you are a fellow SLP it is a great blog to get activities that can be adapted for therapy and if you are parent this is a great blog to get all kinds of great activities and parenting ideas. You won’t be disappointed! And be sure to congratulate Kristina on her new adorable baby boy! See you all Wednesday for the last installment in my Speech and Language Development Series and I’m working on my next installment of my Phonological Series…not sure if it will be up this week or next! Loved this post (I commented on Toddler Approved) but also gotta , I love the way you and Kim are working together! I have been a fan of her blog for a long time, and when I stumbled upon this post on pinterest, I felt like I was betraying her. 🙂 I was so pleased to see that you linked to her blog and her ideas, too! And by the way – the wait time is HUGE for my 19 month old. When I was teaching, I trained myself to count to 5 silently after asking questions, and I find that if I don’t do that, he doesn’t respond! Awe Thanks Katie! Yes Kim a and I love collaborating and working together. We both have the same ideals and beliefs when it comes to early speech and language development and we see the value in working together to help others 🙂 I hope you stick around! So glad to have you here! I just went over and read your top five tips. They are great. I always try and buy toys that you can learn with at the same time as having fun. I found a great teddy bear that used magnets to tell you which part of the body was which. It said the part then sung a tune. I then reiterate it too my child who then would point to that part of the body. Great post ! So happy to hear you found my tips helpful! Hi Katie! What an amazing, generous, helpful and smart cookie you are!! Thank you so much for connecting to all of us “out here” with such a plethora of knowledge! I am a retired slp – – worked in the school system in Sacramento for about 32 years, and now have a grandson, aged 2, who was 2 months premature, had 2 brain bleeds, open heart surgery for a few defects, at age 3 months, and spent 45 days in the NICU after birth. He walked at 191/2 months, and definitely has his own timetable, but is a DELIGHTFUL happy little guy – with a wonderful spirit & disposition, and pretty amazing receptive language skills. Expressively, he is blossoming with ever increasing length of utterances, but with REALLY distorted phonology. He was found to have a very significant (60db) conductive hearing loss a few months ago, now has tubes in his ears, & passed his hearing recheck (Oakland Children’s Hospital audiology center in Walnut Creek – – -wonderful place). So now, figuring it all out is pretty confusing, and I know he is only 2, and has heard things differently for a long time, but how to best support him is something I am uncertain about, but of course want to do. He does a lot of gutteral sounds – non phoneme sounds – maybe because that’s how things sounded before – or? Anyway, where are you located, and do you do consults, and or how much do you charge for an eval – or would you wait until he is a little older and has a little more time with normal hearing to try to figure things out? So sorry, – tough questions. Bless you for being there with so many wonderful tidbits! I typed in Barbara Hodson and there you were! Thank you! I found your tips very helpful. As an early childhood educator, these tips would be helpful for our toddlers in class. I personally find talking with toddlers in clear language helps a lot. I see many people baby talk and I certainly don’t accept doing that. Thanks for the tips once again! Katie, these are some really good things to now about helping toddlers with speech problems. My little brother had a hard time learning how to talk when he was little. It would have been nice to know these things when my brother was little. It might have made helping him learn to talk easier.